I've added a first draft of the file checking. 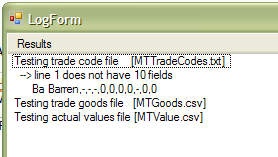 So far it only checks Mongoose trade codes, but here is a snapshot of the current version, along with a file. I've not double-checked (hey, it is 5:38 in the morning!) but my guess is that this is the only incorrect line. The things it checks for the trade codes are the number of lines (and this would only be a warning, not a breaking deal. I do plan on adding a column for passing the checks) (and this is only valid CSV lines, it ignores the headers & blank lines) and that there are 10 items per line. I'll probably get this finished up & re-released over the weekend. If anyone knows a better way other than deleting & reloading the file in Yahoo, please let me know. This is nice to see. I just finished creating my tables, and error. Not looking forward to wading through them to find my typo. I had the advantage of running in the debugger so can see what is happening. I expect to get that completed & re-released sometime this weekend with any luck. I'll post here again when (if) I've released a new version. Sorry it's a pain to create the tables manually - with Mongoose's active license for Traveller I'm just trying not to step on any toes. Actually, it is not really that big of a pain creating the tables. The bigger pain was figuring out exactly what information should go in them and where to get it. Once I had that part done, the data entry was no problem.I actually did it during a Skype OD&D campaign I am in.